I had a wonderful conversation yesterday with someone who is thinking of joining St. John’s. He made an interesting comment, about something I have wrestled with for many years, and which leads to the inclusion of the photo below. He said that it seemed that the challenge of worship is not to turn it into an “experience” (think Jimi Hendrix) while still encouraging a sense of joy in the Gospel. Absolutely! That is the challenge. Walking that tightrope has caused many to fall off in different directions. Worship as entertainment or as performance on one side. Worship as rigid, stiff, and lacking in joy on the other. I will add that I don’t think this is about whether one uses the liturgy or not. I am an advocate of the liturgy. I did my second masters thesis on liturgy. I will always be an advocate of our hymnal, Lutheran Service Book, which I believe is the finest hymnal out there. I believe that this issue is about how much importance and attention a congregation gives to doing the Divine Service well. Many congregations lose the Divine Service in what turns into little more than a performance. Other congregations, on the other hand, take a functionalistic view. As long as there is an organist, six or seven hymns we all like, and a liturgy, we’re fine. Can I just say that neither attitude, it seems to me, really upholds the Divine Service and the gifts Christ gives in it? Christ’s gifts deserve our liturgical attention and our highest praise. They are not a performance of human beings and their fancy dancy music. Neither do these gifts deserve the bland functionalistic treatment they often get in anti-contemporary churches. They deserve good thought and planning. They deserve to be presented in a liturgy that is well thought out and well done, incorporating joyful Christians, joyful musicians, joyful pastors all in the joy which is only provided in the forgiveness of sins. 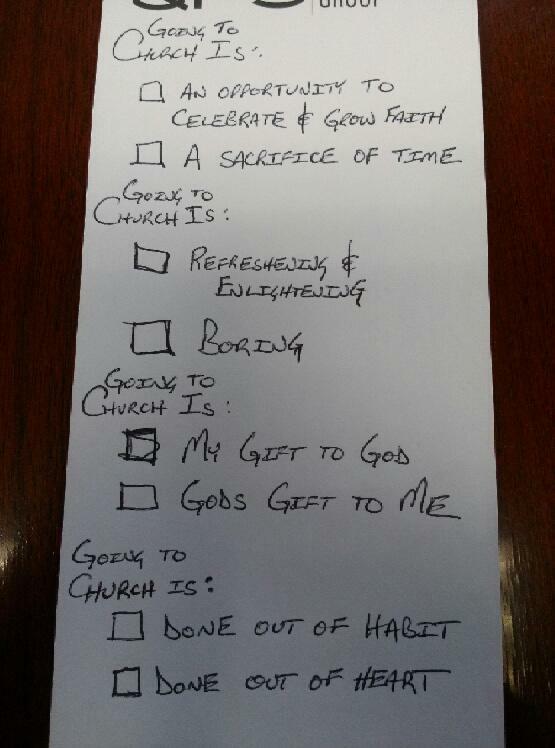 To that end, what is your attitude when you “go to church?” Perhaps the better term is “when you receive Christ’s gifts?” One of our elders put together this little survey and sent me this photo this week to help us assess our own attitudes about going to church. One of the reasons we are concentrating on worship here at St. John’s is simply that the people of our congregation might indeed learn a new way of looking at it, that they might have joy in all the aspects of the Divine Service. Especially as they proclaim and celebrate Christ’s gifts, which are the center of why we are there. God’s grace deserves our highest praise. I pray that this Sunday, you would not say to yourselves, “Today I have to go to church.” I would hope you look at that little survey and say to yourself, “Today I get to receive Christ’s gifts!” We’re working hard here to adorn those gifts with the best of our efforts. I simply pray that your joy is magnified by Christ’s gifts.